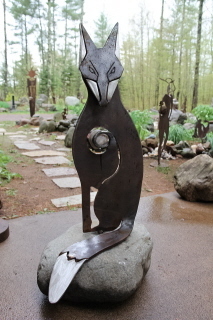 Recently I completed and installed Foxfire at a lovely cabin on a beautiful lake for wonderful friends. 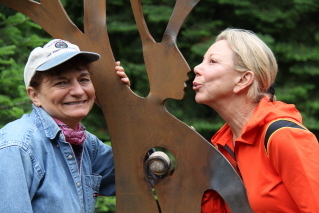 Foxfire explores a primary artistic theme of human interaction with the natural world around us. The creative perspective of people interacting in our natural wooded setting offers many opportunities for exploring a north wood’s theme. 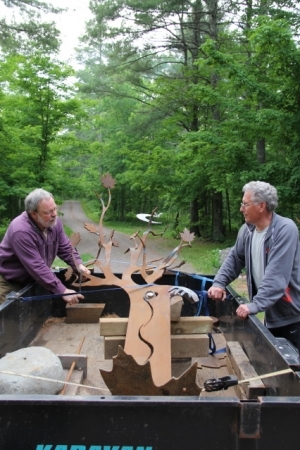 The creative project started last summer when friends asked me to design a figurative sculpture for their area lake property that is also known as Foxfire. As with other commissions, our discussion of the general concept became a preliminary sculpture drawing. 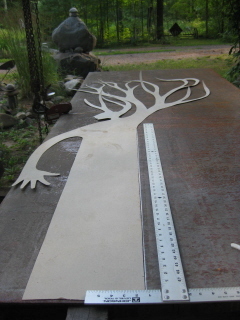 This drawing was further revised into a final sculpture design that was the plan directing the fabrication. 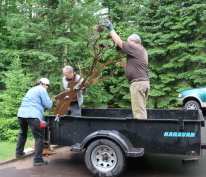 After the design was set, the steel was ordered and delivered to Dragonfly Studio. 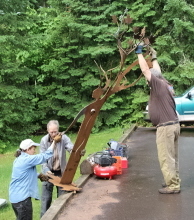 Transforming a four foot by ten foot sheet of 3/8 inch Corten steel into a completed sculpture requires numerous steps. 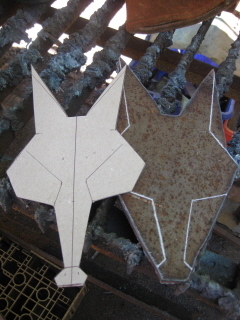 Full size heavy paper templates were created to facilitate the transfer of the design graphic to the steel. 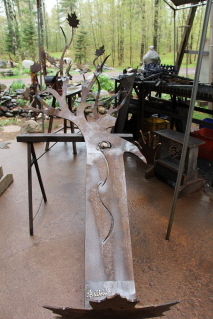 A fifty amp plasma cutter was used to cut the components of the sculpture from the steel sheet. 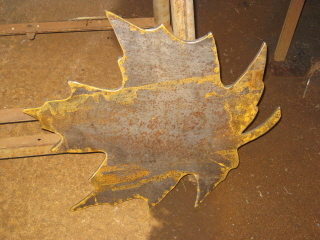 When the steel is cut substantial edge and surface clean up prepares the piece for bending. 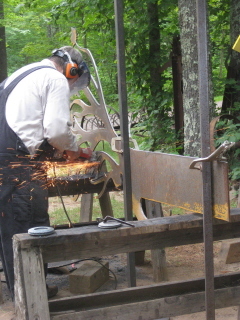 Oxygen/acetylene tanks were used to heat the steel to red hot for bending into the finished shape. More surface cleaning follows the heating and bending. Over time and through many steps, the flat materials take on a dynamic form. 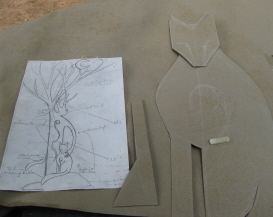 A fox image to accompany the main figure was cut and assembled separately. Near the end of the process the large figure’s left arm and hand were bent to embrace the fox that had been mounted on a rock. 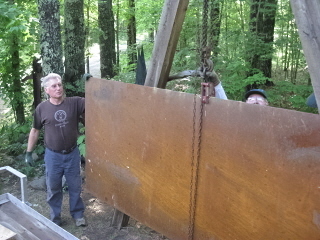 Concrete foundation excavation and pouring preceded the sculpture installation. 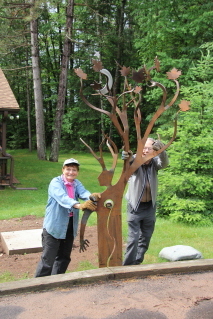 The installation was followed by the finishing touches of landscape accents. Set on a wooded slope at a lake cabin, Foxfire stands tall blending nicely with the property’s pines and mixed hardwoods. 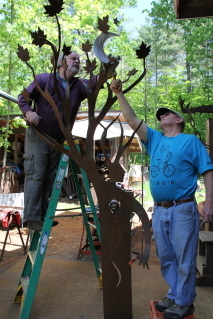 Corten steel was selected for the sculpture due to its manufactured property of oxidizing to a richly colored and evenly distributed reddish brown patina. 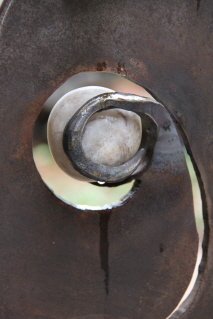 In addition stainless steel accents in the sculpture provide a dynamic reflective light aspect. 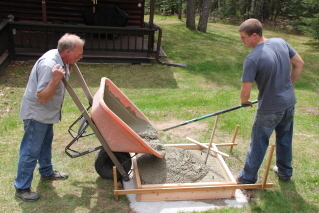 The creative process involves quite a bit of team work. From concept to completion, Foxfire involved sixteen individuals. 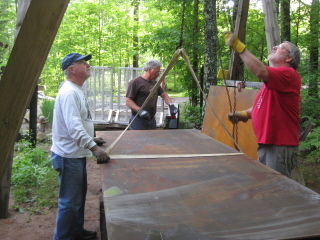 Following my lead, the creative team facilitated materials procurement, fabrication, transportation and installation. With a focus on my original design, my team helps move the process to reality. The central stylized figure exhibits an arm rising upward that transforms itself into many branches of a maple tree. 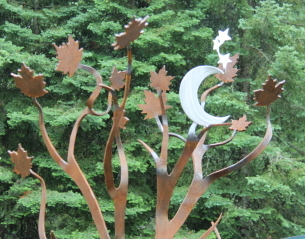 Perched near the top of the maple sits a stainless steel moon and star. 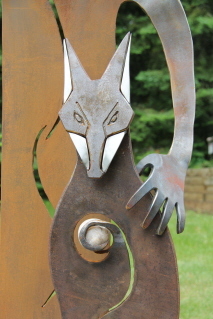 The other hand of the Foxfire figure curves around the three foot tall steel and stainless steel fox sitting on top of a volcanic rock with an interesting crystalline structure. While visually striking in size and appearance, Foxfire blends naturally with the surrounding forest. Together the fox and figure stand as sentries, overseeing the surrounding property, watchful of the natural world around them. 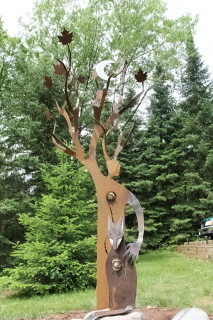 Like the native trees, the steel figure gently flexes with the breeze. 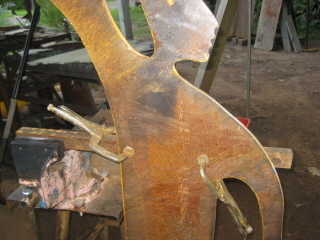 Reflective values of the stainless steel components add yet another dimension to the rusting steel figure. The viewer will enjoy the visual spectrum presented with the daily variance of light and the annual changes of seasons. © 2011 Sara Balbin – Dragonfly Studio, Drummond, WI Ph. 715-798-3848 email:gems@cheqnet.net|ProPhoto Photographer Blog by NetRivet, Inc.